Zack's Beach Catering & Concessions provides rental items such as surfboards, bicycles, beach chairs, umbrellas, body boards, tandem bikes, baby buggies and roller blades (inline skates). 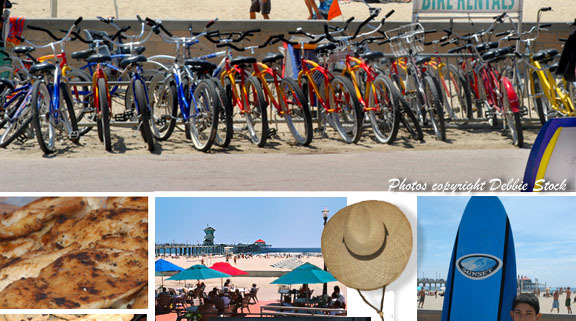 Located adjacent to the Huntington Beach Pier in Huntington Beach, California, the state-of-the-art concession store also sells sun hats, sun block, lotion, film, postcards, shirts, t-shirts, jackets, swimsuits, towels, sunglasses and more. Souvenir statues, gifts and functional items for the beach are all sold at Zack's. Provided on location are surfing lessons, as well. Zack's staff are trained competition surfers who know how to teach the basics and help you get up on a board. They can suit you up with a wetsuit and surfboard to have you on your way to a wonderful day at the beach. You can tell everyone that you surfed Huntington. Zack's concessions sell sodas, water, snacks and a full dining menu that also includes summer outdoor barbecues many weekends. Hamburgers, hot dogs, French fries, chips and salsa, ice cream treats, salads, smoothies and a large selection of tasty treats are sold during regular daytime operating hours. Prices are available on the website link below. Located directly on Huntington City Beach, Zack's Beach Catering & Concessions is a city-licensed business providing service, rentals and food to millions of tourists from around the world and local Huntington Beach residents for over 15 years. Zack's is also conveniently located on the beach bike and jog path. Parking is conveniently located at the building in the Huntington Beach City parking lot with a pay station requiring bills or coins. Handicap access parking is located at Zack's with sand wheelchairs providing beach access for those who lack mobility. (Always call ahead to check availability before going.) Zack's Too is the 2nd catering and rental family-owned and operated facility located at Beach Boulevard and Pacific Coast Highway. It is open during summer months near the firepits. Wood for bonfires is sold at that location. What's unique about this place is its catering. You can hold a birthday party, anniversary, wedding, kid's party, corporate incentive or team building luncheon or dinner with games and fun, Mexican-themed meal, volleyball tournament...you name it. Zack's has shaded tables with umbrellas on a patio deck right on the beach. There are free summer concerts next to the patio, with restrooms and showers all available. For more information on hosting a catered function, call (714) 536-0215. For more shopping, see the Shops Page.